Tourists often ask me where they can see Costa Rica indigenous tribes. When this happens, I always mention the fact that indigenous people make up less than 1 percent of Costa Rica’s population. How much do you know about the history of your people and your DNA? Do you think it is important to learn about ancestors? If you visit a country, do you want to learn more about their history? I do. Those of us who grew up in Costa Rica learned about our ancestors in school. We hear about our history all the time, but I never took studying my roots seriously until I visited an indigenous community for a traditional festival. Imagine that you’ve been invited to a party where you don’t know anyone. I felt like that when Rodrigo proposed the idea for us to go to “The little devil’s festival”. I have heard about the festival, and it always sounded like a nice cultural thing to do, but I wasn’t sure what to expect. When I started to research about the topic, most the information I found was in Spanish. So I thought it might be helpful to create an idea of what to expect from the festival so you can visit when you come to Costa Rica. So let me tell you about my journey exploring my roots. There are two ways to get here if you are coming by car. From San José, take the Inter American highway and follow the signs to Pérez Zeledón. Keep driving until you get to Buenos Aires de Puntarenas and then keep going for about 30 minutes more on the same route # 2. Then when you get to Paso Real (main entrance to San Vito de Coto Brus) you need to keep going on the Inter American highway 7 km (10 minutes) more to Curré. From San José, take the 27 highway—the same one that you take to go to Jacó or Manuel Antonio. You will pass the towns of Dominical and finally get to Palmar Norte de Osa, where you will see an intersection in Palmar Norte. Take a left, go 28 km Northeast, and you will see signs for Curré. According to the Facebook page REY CURRÉ YIMBA, you can take a bus from Tracopa Terminal (http://www.tracopacr.com) (22214214). You have to order your ticket to Curré through Cerro de la Muerte. DON’T TAKE ROUTE 27 IF YOU ARE GOING BY BUS. Buses leave from San José at 5 a.m., 7 a.m., 8:30 a.m., 10 a.m., 1 p.m., 2:30 p.m., and 6 p.m. Always double check the schedule before your trip because buses change all the time in Costa Rica. Duration of the trip: To give you an idea, the trip took us around 6 hours (with about 1 ½ hours of rest time for restrooms and lunch). So I would estimate that it takes approximately 5 hours from San José. Of course, it will be closer if you decide to stay in Manuel Antonio or Dominical area. Best dates to go: The festival in Rey Curre usually takes place during the last week of January or the first week of February. On a sunny Saturday of January, we drove down south to enjoy the Festival of “Little Devils.” We arrived around 1:30 p.m. It looked like a party with music and people outside. We quickly found the spot where the afternoon session was going to start at 2:00 pm. After parked the car and started to follow the crowd, which included people from town, visitors like us from other parts of Costa Rica, foreign tourists, journalists, and photographers (Rodrigo included). We were all there to observe the games, so we just mixed with them and went with them from house by house. The dance and the place with the millenary dust under the summer sun produce almost a hypnotic effect on the visitors that immerse themselves in a 500-year-old ancestral tradition. There are two actors in this game: “The little devils” represent the indigenous people, warriors against “the bull” who represents the Spanish conquest. According to the anthropologist Jose Luis Amador (Revista Herencia Vol. 18, Núm. 1 (2005); Amador, the Game of the Diablitos is the traditional party of the Boruca people. People mentioned that after the festival, people end up with injuries like bruises and cuts. In the worst cases, some of the players get a broken nose or get knocked unconscious. After the dance finishes in each house, 18 previously selected families from the community give the devils and the visitors a drink called “Chicha.” It is disrespectful if you don’t drink if they offer, so make sure that you bring a plastic cup, or get your “Guacal” (calabash gourd) to drink out of. They sell those as part of the crafts that they created. “[Chicha is a]” natural drink based on corn extracted from the plant, which the next day is semi-dried, then wrapped in a banana leaf and expected to begin to sprout. When it becomes a plantlet, it is ground and converted to some sort of paste, then is mixed with water in a large bowl. Then they add sweet sugar cane and leave it for 2 days. When served, ice is added. It has a soft taste, but be careful.” Chicha is alcoholic. The chicha is given by the families that opened their doors to the dance that day. I’ve seen the Fiesta de los Diablitos masks in most of the souvenirs stores around the country. They are made by indigenous people and represent the animal of the spirit. But really there is a lot behind the mask. The Boruca style is different than other indigenous communities. They use masks made from balsa wood that probably has been manufactured by each of them with their particular motivation. The lively painted masks are intended to infuse fear in the opponent. They have faces of wild animals. 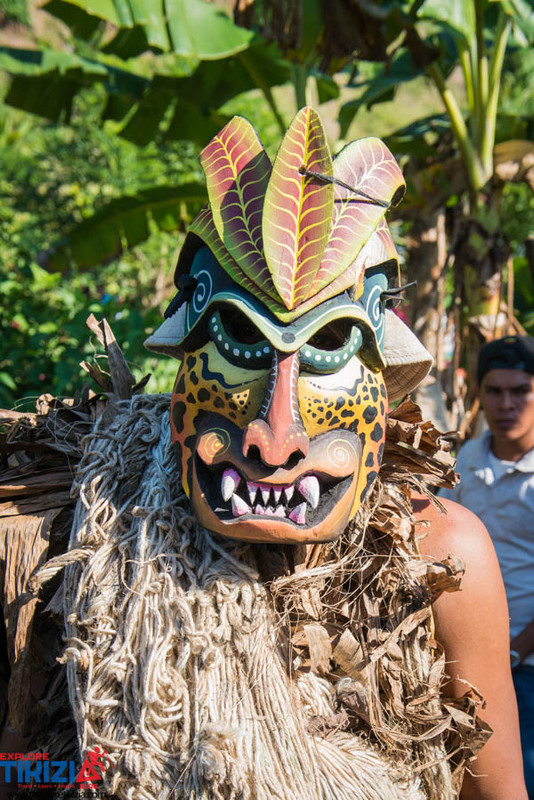 The characters in the festival have large eyes with“gangoche” (gunny sack)bodies and banana leaves until the ground. We saw a kid putting his clothes (leaves) and they told us that this is a very private moment that needs to be respected (like when you go to the bathroom for #2. LOL). As the day passes, the game intensifies. Even the children, in tiny masks, try to fight with the bull. It was so interesting to me to see the kids learning about the tradition. They also have their turn to measure forces with the invading giant or play an instrument. The game was almost finishing and then we were planning to go back to Uvita to spend the night because I couldn’t find a lot of information about accommodation in the area. However, after a quick stop to the restroom, we found that they were selling traditional food in the area, so we decided to make a stop for coffee and taste the traditional food. We can have called that moment a coincidence. Or, looking in a more mystic way, the vibes took us to this house. The people there were the nicest people ever. They fed us and offered a very reasonable price for us to put up our 2 tents and spend the night on their patio. We met other visitors from the surrounding areas and even our new friend Daniel, who was doing a work away in Costa Rica and had the great chance to explore the area. It was the best day ever having one of my first experiences in an indigenous community and doing rural tourism that will benefit that family. Staying with the family was an awesome way to finish the day. We stayed the next day to explore the museum and enjoy more things to see around the area. It is a beautiful place. My heart was touched by the people’s humility and the fights of these people who don’t want their roots to disappear. I always felt welcome. So going there was like visiting a port that took me to deep waters to explore the roots of my country. In conclusion, I realized I have more in common with my roots than I expected. The Indian pride is imprinted on my breath and carved in my skin. I will always remember the images of a people who struggle every day to preserve what belongs to them. It’s a pure image of the force for continuing to belong. My idea with this blog is to share my experience but also to invite you to explore your roots. In Spanish, we have a phrase that says: “to know where we come from is to know where we go.” If you come to Costa Rica, feel free to contact us. I will be happy to assist you to take a trip like the one that I just described. Please share your thoughts in the comments. Nicely written article…thanks. Do you know the specific dates for the festival in Rey Curre’ for 2018? Also, is there any accommodations or homeowners that offer rooms?